The best things in life are indeed free. :) I've known about Starbucks' free coffee grounds for a long time, but I used to think that the grounds were really just useful for the garden. I never really paid any attention to it, until I got to see one of Michelle Phan's videos on YouTube wherein she was using spent coffee grounds for beautification purposes. For her scrub, she simply added olive oil and used the spent coffee grounds. I wanted to add more luxury to it, so stay tuned for how I formulate my luxurious coffee grounds face mask and body scrub. So this is how I do my body scrub. Start with about 60 mL (or about 3-4 tablespoons) of coffee grounds. Since this isn't a baking recipe you can increase or decrease the amount as you please, but for one person's single usage needs, this is already enough. The coffee is great to aid in removing cellulite because of its high caffeine content (anti cellulite products contain a lot of caffeine :P ), and it adds grit and roughness. Then add in about 30 mL (about 2 tablespoons) of milk. I love using whole cream milk, and for this one I'm using Emborg milk. I just love Emborg milk because it's tasty, creamy, and relative to other brands it's cheaper. I put in milk just to feel luxurious. This is how it looks like after adding the milk in. Gosh there's still so much brown color in it, for all we know we might still be able to steep the used coffee grounds and drink it (ho ho ho). I know it's not visible, but now, in my scooper is about 10 mL (about 1-2 teaspoons) of virgin coconut oil. You can also use olive oil for ths purpose, but I like VCO more as it's locally produced, really great on the skin, and is more economical. The great thing about combining this with coffee grounds is that the grounds remove the dead skin while the VCO seeps in; the result is dead skin-free, super smooth skin. So this is an optional step. 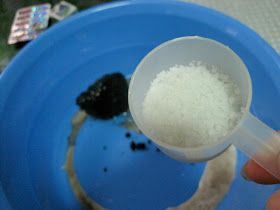 You may choose to add in about 1 tablespoon of rough salt to increase the roughness of the scrub and to rev up the cleansing factor (as salt solution is great in cleansing dirt), but if you have more sensitive skin or if you don't like to add salt in, it's also fine. So this is our scrub so far. It looks icky but feels great on the skin. I could do a demo on how I scrub my whole body, but I might get sued for public indecendy (ha ha), so here's a demo on how it looks like on the arm. It feels great on the skin as the coffee and salt are so rough, and massaging it in is a total treat. I leave this on for about 5 minutes or less. It's boring to wait in the shower so I don't leave this on for too long. Now here's how I do my coffee grounds face mask. 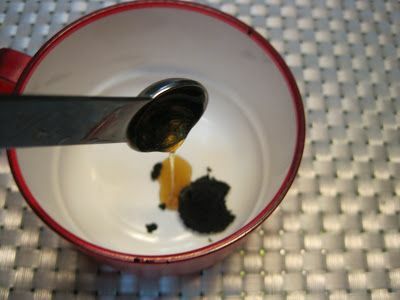 Again, I start with coffee grounds for its grit, but this time I'm using 1/4 teaspoon-- and yeah that's even much more than what my face needs. The next part is to add 1/4 teaspoon of water to further dilute the mask. You can also use milk to feel luxurious or to rev up the nourishment factor. And for someone like me with very oily skin, I'm adding in 2 aspirin tablets. The active ingredient in aspirin tablets, acetylsalicylic acid, has its derivatives (salicylic acid) often found in pimple gel preparations. It's great not only as an analgesic but also for keeping those pimples at bay. :) Gosh it's as if my face mask has a face of its own. Combining everything, this is the pasty face mask product. It also feels great on the skin. And now this is me with the mask on. The great thing about this mask is that it doesn't drip down while it's on, I can go on doing other tasks with this mask on. It's just great to massage the mask in as I can give myself a free facial in the process. I leave this on for about 20 minutes and then wash it off. I then end the whole experience with toner. Enjoy your face mask! Good luck!